It’s been 200 years since the surrender of Fort Detroit during the War of 1812. But it’s a big day for Detroit’s early history enthusiasts, and I’ll kick myself if I miss the best chance in a century to commemorate it. So here it is: On August 16, 1812, after a brief rain of cannon fire and some fancy footwork by General Isaac Brock and Tecumseh, General William Hull surrendered Fort Detroit to the British. Things got ugly on August 15, when Brock sent a message to Detroit demanding Hull’s surrender. When Hull refused, Brock fired away from a cannon battery on the shore and armed brigs on the river. … It was watched with an anxious eye by those who saw it, as a messenger of death, perhaps, to some fellow mortal unconscious of his approaching fate. … It passed over Jefferson Avenue and fell upon the roof of the dwelling of Mr. Augustus Langdon, which stood on what is now called the southerly corner of Woodward Avenue and Congress street. Passing through the upper rooms of the house, it fell upon a table around which the family were seated, and then descended through the floor to the cellar — the fuse burnt down nearly to the powder. The family fled with expedition to the street which they had just reached when the shell exploded — tearing up the floors and carrying away a portion of the roof. One of the French citizens, who lived in a small house near the river, while the shots and shells were flying over him, stood unconcerned in his door way smoking his pipe. Presently a shell whizzed past him, taking with it the pipe from his mouth. He was unharmed, but was so indignant at the unceremonious treatment and the loss of his pipe that he seized his musket and rushing to the river, waded out as far as he could, and fired at the battery of the enemy until his ammunition was exhausted. In the middle of the night, Tecumseh and his forces slipped across the river and surrounded the Fort, followed at dawn by Brock’s forces, who intended to force a fight. The Indians, the story goes, paraded in circles through a gap in the forest, raising the war cry and terrifying everyone into thinking there were thousands of them. The bombs continued to fall, killing two officers and a few soliders. Women and children, including Hull’s own daughter and grandchild, were shuffled to safety in a root cellar. And so, to everyone’s surprise, including Brock’s, came the moment of Detroit’s great degradation: Hull (who may have been drunk! Or maybe that is just something we tell ourselves) sent his son Abraham to meet the British forces with a letter that read simply: “Gen. Brock — I propose a cessation of hostilities for one hour to open a negociation for the surrender of Detroit.” It was around 9:00 a.m., and although there was some confusion over the letter’s delivery (confusion among letters being a theme of the War of 1812), by noon a white tablecloth flew over the Fort’s ramparts, and Brock had declared the entire Northwest Territory for Great Britain. It wasn’t a proud hour. In fact, it was so embarrassing that Detroiters remained bitterly angry about it for at least 150 years. But it was our hour nonetheless. How will you observe this dark and bungled anniversary? Fort Wayne hosts a living history commemoration this weekend and Navy Week will be here Sept. 4 – 10 (see also 1812detroit.com). I think I’m just going to walk my dog on the river and think about the past. For a thorough and readable account of Detroit and its role in 1812, try Bill Loomis’s recent article for the Detroit News. 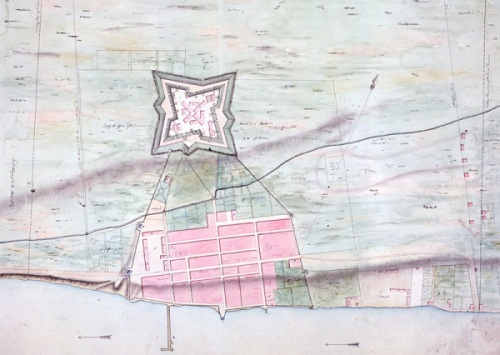 In June I wrote about why Detroit should care about the War of 1812. My favorite local War of 1812 hero is Alexander Macomb. I still don’t know where Lt. John Brooks, Jr. is buried, and probably never will. Forthcoming: A CBC documentary about the War of 1812 in which I may or may not sing the Star Spangled Banner on the corner of Fort and Shelby. A small bit of irony of this is that one of the American officers killed in the initial bombardment was Lt Porter Hanks. The commanding officer of the fort on Mackinac Island that was captured by the British without firing a shot a few months before. Although I would say he kind of had an excuse of not knowing of the declaration of war. He was in Detroit to stand court martial for his surrender. Man, talk about having no luck.